Manila, Philippines - A man killed his daughter inside their house on Tuesday morning after having a fight on the phone with his wife who left him. In a report of ABS-CBN News, the suspect was identified as Mark Alvin Manliclic, a resident of Barangay Sta. Lucia in Novaliches, Quezon City. Around 3 a.m., Manliclic told relatives of the victim that his 7-year-old daughter Angel was already dead. However, they refused to believe it at first. 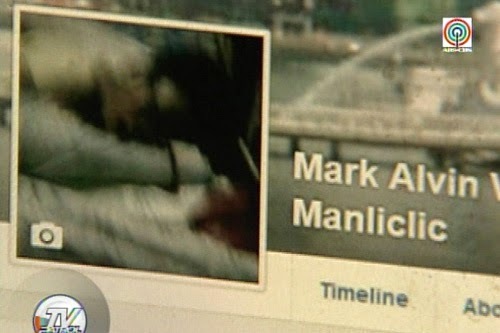 Manliclic has admitted that he was the one who killed his own daughter. According to Manliclic, he and his wife had been fighting for some time now. Their rift became worse after he found out that his wife was already in Canada, after having been told that she would go to Quezon province. “The wife was apparently unable to answer some of his messages, so the suspect eventually got mad and said he would kill his daughter should the wife refuse to come home,” Chief Inspector Rodelio Marcelo, head of the Quezon City Police District’s Criminal Investigation and Detection Unit said. He reiterated the same threat when he talked to his wife over the phone on Monday night, his relatives said. The girl, aside from her throat slit, also bore 6 stab wounds on the neck and other parts of her body, police said. The suspect even made the photo of his bloodied daughter as his profile picture on Facebook, but it was eventually deleted later in the day. Manliclic's relatives said the suspect was under the influence of alcohol when he killed his daughter. Manliclic is now in jail and is facing parricide charges. According to report, a medical exam will be done to determine if he was also under the influence of illegal drugs at that time. Meanwhile, netizens on Wednesday reacted to this surprising news and suggested to bring back death penalty in the Philippines to stop heinous crimes.